Natasha Wilch went from starting a physiotherapy company from her car in 2015 to winning the 2017 Entrepreneur of the year. Have a look at her background story and then read her interview below, where she talks social media tips, achieving success, and how she was able to scale up her business over two years to compete, and win, against entrepreneurs across Canada. How did you find yourself in the running for Entrepreneur of the Year? Did you need to apply or were you nominated? To be considered as a nominee for the award you had to submit an application and a short video. To be honest I didn’t think I stood a chance, but I thought, “why not”? After the applications were submitted, Futureprenuer reviewed chose five finalists from across the country. No two finalists were in the same field; it was interesting to see! There were two from the West Coast (myself and a gentleman from Vancouver) and the other three were from Ontario and Quebec. What does it mean to you to be awarded Entrepreneur of the Year? I’m so excited! As I mentioned, the finalists were all from different fields – and they were amazing entrepreneurs doing inspiring work. Winners were voted in by a public vote. The fact that my clinic was voted as the winner shows how much value our society puts on their health. It shows the importance people feel towards what they need to do to maintain, improve and manage their own health and wellness. I’m honored that Canada voted for me. It’s validation for what we do and it empowers me to keep reaching and serving. How did you go from starting your own home services company to scaling up to a clinic and being awarded Entrepreneur of the Year in less than two years? I had a vision. Honestly, this is SO important. You need to have a vision to help ground you, to help you choose which opportunities to take and which to pass on, to help remind you why you are doing what you are doing. I’m slightly more comfortable with taking risks now then I was in the beginning, but I’m still a cautious individual - so to me, knowing where I wanted to go, I simply stayed focused on the target. As demand for services grew to a point where I could support another team member, I added it – but I never overextended myself. That meant I wasn’t hurried or rushed to add team members who didn’t share the same passion I did for what we do at Symphony. Moving into the first clinic space came earlier than planned – the opportunity presented itself 10 months after I opened my “doors” for service, whereas I had planned to open my clinic after two years of running the business. I initially shut down the opportunity without even entertaining the thought. Then, luckily, my brain took over and I re-approached the building, and voila! I was terrified at first though (laughs). Now we are planning to move into our new clinic space in March of 2018. “Don’t let you vision be dictated by your current capabilities and skills. Use your vision as a reason to learn, to grow, and to rise up”. I live by this quote by Brendon Buchard. What do you think you did that made you so successful? I think this could be attributed to a few different things – my approachability would be one. Building client rapport and ensuring my clients have a positive experience always remains my top priority. Sometimes, I don’t believe the clinic environment is the best place to build that relationship or the information you are trying to get across may not best happen in a clinic setting. This is why I go into the community to dragon boat competitors, hockey practices, support groups, physicians’ offices; all to help spread the word. I’ll say it again: surrounding myself with a team that shares my same values is key! Not growing too fast or overextending myself financially has allowed me to slowly build the team I have. I grew up in Cranbrook, BC with my mom, stepdad, and younger brother. I would travel to the lower mainland a few times a year to spend time with my dad, stepmom, and three other brothers. When I was 19, I decided to move to New Jersey for a few months to be a live-in nanny. Then, it was off to Vancouver. At the beginning of my university education, I didn’t know that I wanted to be a physiotherapist. I had planned on being a surgeon. However, I also valued having children, and I realized that the schedule and hours of physicians I knew didn’t seem to jive with that. I always loved learning about the human body and how it moves, how it connects; physiotherapy seemed like the natural next path for me. I started off at Langara College then finished at UBC with my bachelors in Health Sciences & Kinesiology and from there dove right into my Masters of Physical Therapy. What factors did you consider before starting Symphony Rehabilitation? I also needed to review the financial aspect of how much I needed to make to break even and whether I felt I could achieve that. I knew it was going to be a lot of hard work, especially because I didn’t know anyone in Nanaimo and no one knew what type of therapist I was. It sounds like you have a very positive, enthusiastic team. How do you recruit and keep such strong players? I have an amazing team! Honestly, I can’t say enough wonderful things about them. The key is always hiring the quality of person you need and never just hiring for quantity. When I meet with a potential team member I truly feel that we are interviewing each other. For example, does my clinic, my ideas and my vision fit with what they want to be doing? And vice versa. I respect them and all of their skills – I foster those if I can and constantly involve my team in happenings and brainstorms around what I want to do. How much of your clients are you able to treat with preventative measures (concussion, people coming in without injuries)? I love preventative physio! If you are an athlete, play a recreational sport or are just plain active, I’m a HUGE advocate for what I call “movement check-ups.” Just like you see your general health practitioner a few times a year, go see your physio a few times year. Have a movement analysis done – make sure your body (your machine) is working efficiently and everything activates properly. For our athletes, we have a system called the Senaptec, which allows us to assess areas of sport performance including reaction time, hand eye coordination, inhibition, and so much more. The assessment compares the athlete to others in the same age range and sport and shows us where they can use improvement. We can then address and improve things like reaction time and peripheral awareness, which in turn makes them more alert of what’s happening on the field or ice. Being more aware can improve their game play and decrease their chance of injury. What advice can you share with physiotherapists who want to run their own practice? Love what you do. Have a clear idea of why you want your own clinic, as opposed to working as a contractor. Know your strengths and weaknesses, so you know where you need to draw on mentors. Always hire for quality over quantity. Have fun with it! You sound like you practice gratitude. How do you maintain such a positive mindset and avoid burnout? I strongly believe in personal development, which is separate from professional development. I surround myself with like minded people – we fuel, encourage and inspire each other. Physical activity is key; it’s my stress relief, headache reliever and emotional release. I also have a somewhat regular routine (that needs to improve) of mindfulness, visualization and journaling. I continually go back to my vision and why I’m doing what I’m doing. You’ve accomplished so much; what do you want to do next? Oh, I have so many plans (laughs). I want to continue to evolve the telehealth side of the clinic. I want to bring more awareness to the services we offer through this mode of delivery – research supports it! I also have a dream of serving the country of Canada with my telehealth services. Right now, licensing in each province restricts that – but it’s on the goal list! Locally, I want to own my clinic’s commercial space and become a leader for rehab in our community. I love education, teaching and speaking, so I’d like to grow these areas as well. How do you decide on content for your “Ask a Physio” topics? I have a few ways. There may have been a client who asked me a question during the week that I think others may be interested in learning more about. There may also be a topic that I’m trying to bring more awareness too. You share a video of you dancing to promote your clinic, which is a beautiful way of showing (not telling) how you can help. How did you shoot this video? What advice can you share with physios who want to get started creating video content? I love that video! There is a part two coming soon along the same lines. This video explains where our clinic name comes from. Every individual has their own “symphony”, or the movement you create in your body. To me, my symphony is dance. At our clinic, our mission is to bring you back to your joy of movement. It’s one thing to say that, but if I can evoke an emotional response from you, then you’re going to remember me much longer. That was our goal when we shot this. I filmed this video with an amazing producer and videographer who is also a friend. We discussed the concept, shared ideas and shot it in the clinic. I wrote the video copy and chose the song; he worked his magic. It was all done very quickly. In terms of getting started with video content: just do it! Decide if you want to do pre-filmed, “live”, or both. How do you want to use video? What is your goal of shooting it? Will you be in the video or will you feature someone else? Honestly, I think you should just dive in and get your feet wet – they will improve as you go along. What have you found is the most effective way to connect with your patients? Be yourself. Be open. Be honest. I have profound respect for my clients and during our sessions, they have my undivided attention. Our 1:1 appointment structure allows for this, so I don’t need to keep my eye on the clock to change another client’s exercises or remove a modality. I also share some of my life with my clients. I feel that if I am asking about their social life and hobbies, they should be able to ask me about mine. It opens the door for conversation and helps to create opportunities for you to integrate your treatment into more aspects of their lives. You shared a video about some of your favourite stretches. Do you ever worry about viewers injuring themselves from improperly following your teaching? This is always on my mind in some way – but it’s also why I keep those types of videos very basic. This is information they could find on hundreds of places on the internet; it’s very generalized. 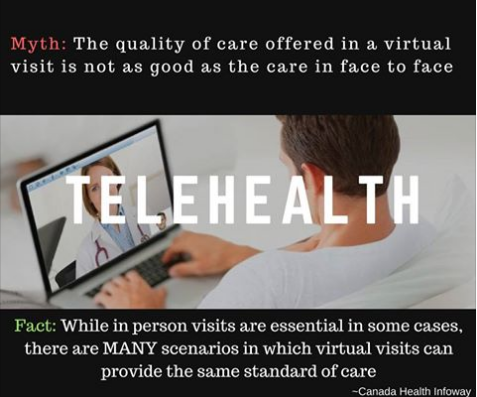 Our telehealth services include a live face-to-face feed with the client, like Skype. When talking a client through an exercise, we do it together. When I say I am going to send them an exercise program, it’s always based on what we completed through the session together. I never ask them to do anything that I haven’t seen them do first. In this way, it’s really not any different then showing someone standing in front of me at the clinic. Our exercise programs have both video and written instructions, and we encourage our clients to message us through our app to clarify anything between their appointments. 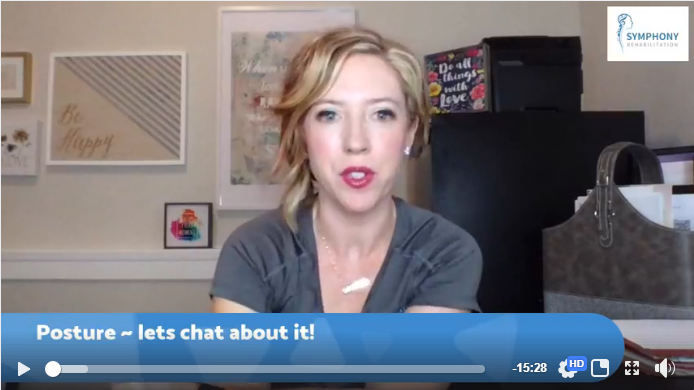 Your Facebook feed is packed with a question of the week, “meet the team”, inspirational quotes, patient testimonials (while respecting patient confidentiality), and videos where you talk about topicslike concussion, sleep hygiene, and posture. How do you make sure that you post regularly? I love that you looked through my Facebook feed! I do a batch post every week. I sit down, plan the material around a theme or main topic and then schedule it all in at once. That way, I know I will share at least one post a day. If I post extra because I have some great news to share, then it’s just a bonus post. In all honesty, I’m still learning the ins and outs of Facebook. I do know that it’s an amazing platform and in terms of the telehealth, a fabulous way to spread awareness of who we are and what we do. Please join us in congratulating Natasha Wilch for being voted Futurepreneur’s 2017 Entrepreneur of the year!